The Harvard GSD Aecom Project on China was a three-year research and design project premised on two fundamental ambitions: recuperating an idea of the city and pursuing alternative forms of urbanization in response to the challenges posed by the developmental city in China. The former treats the project of the city as a cultural, political, and aesthetic act; the latter views the city as a site for urbanization, articulated through architecture, landscape, and infrastructure. This endeavor is analytical and propositional in equal measure. Each year, the Project on China focused on a theoretical problem and practical challenge posed by the model of the developmental city in China, using a particular city as an exemplar: the megaplot with Xiamen as a case study; the future of the city in city-regions and the effects of cross-border urbanization, with Macau as the paradigm; and the status of the countryside in the context of state-driven initiatives to urbanize rural areas. Common Frameworks brings together design projects from a sixteen-week studio over three years, with research and writings on cultural, political, and historical aspects of the city. 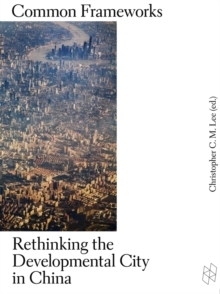 It presents a critical reflection on the developmental city and the recent hyper-rapid urbanization in China.